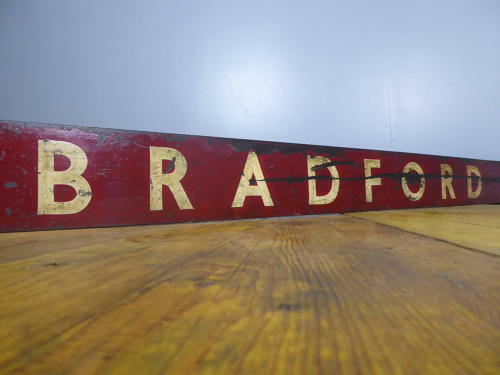 A wonderful antique painted timber railway destination sign for 'Bradford'. A charming & beautiful piece of history likely used by LNER, the thick off-white lettering hand painted on a wonderful rich red background on solid on mahogany board, all with an amazing age related patina. At nearly 2m in length I would rather this was collected in person from our warehouse here in Downham Market however it can be shipped at a cost of £35 tracked & signed for 48 hour delivery (too large for regular service so has to be sent via Parcelforce 'Large').